Turn craft time into message time! Discover how fun and easy it is to combine powerful Bible-centred messages with cut-n-crafty reminders for preschoolers to make and take home. PRESCHOOL BIBLE MESSAGE MAKE-N-TAKES contains 50 clever craft ideas that teach preschoolers about God and his Word in memorable, age-appropriate ways. Preschoolers make crafty projects as they learn important truths about God, then use their crafts to sing songs, play games, repeat catchy rhymes and more to emphasize what's been learned. And with the I-Can-Learn-God's Word cards, even preschoolers can learn Scripture with a bit of help from home! Now that's big learning for little kids! PRESCHOOL BIBLE MESSAGE MAKE-N-TAKES are simple enough for an all-thumbs three year old, while engaging enough for a hard-to-please five year old. Perfect for any preschool program with lively 3 to 5 year olds! 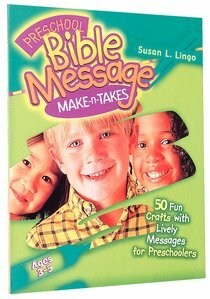 About "Make-N-Takes: Preschool Bible Message"
50 exciting devotional talks based on biblical concepts and Scripture. Includes a correlated craft to reinforce the message. This book provides 50 Bible talks and craft ideas to help teach preschoolers about God. Talks include songs, action rhymes, finger plays, and other age-appropriate activities. Susan Lingo is the author of over 55 books for children and teachers, including My Good Night Bible, Collect-n-Play Games, Collect-n-Make Crafts, and A-Z Object Talks. She is a former elementary school educator with more than 15 years of experience working with children.